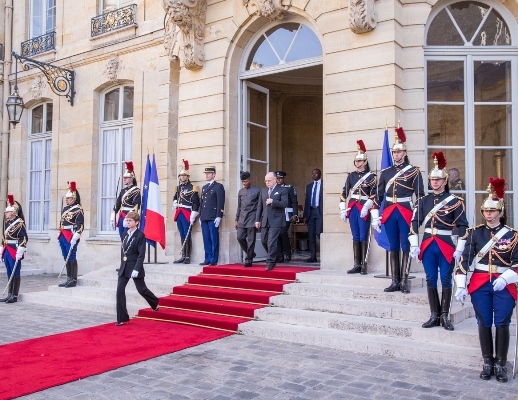 Prime Minister of France, Bernard Cazeneuve, welcomes Vice President Yemi Osinbajo to France. Nigeria’s Vice President Yemi Osinbajo was received by the prime Minister of France, Bernand Cazeneuve in Paris, France. The duo discussed and agreed on greater cooperation to forge better economic and security development. According to NAN, following the meeting, the both countries agreed to continue to deepen the buoyant diplomatic, economic and military relationships between the two countries. Both governments are exploring new ways to confront and defeat the terrorist. Osinbajo explained to the French leader that the Buhari administration had made tremendous progress regarding the atrocities caused by Boko Haram. The meeting was held on the sideline of the just concluded global forum on Anti-Corruption and Integrity hosted by the Organisation for Economic Cooperation and Development (OECD). Osinbajo conveyed the warm greetings of President Muhammadu Buhari to the French President Francois Hollande noting that the Nigerian President is aware of the commitment and support of the Hollande towards the fight against Boko Haram. “We are thankful for the work you are doing with Nigeria. Generally, the stemming of the spread of terrorism in the Sahel is much due to French’s role, and we are thankful for that contribution,” Osinbajo said. The Vice-President appreciated the French government for its hospitality to him and members of his delegation in France. He also sympathised with them on the French school children injured in the recent Westminster terror attack in London. The Prime Minister said the French government would focus on how to enhance and deepen the relationship with Nigeria, including on issues of counter-terrorism and sharing information when it comes to deradicalisation. He also commended Osinbajo for his support for President Buhari, especially by holding the forth as acting President while Buhari was away and congratulated the Nigerian President and military over the degrading of Boko Haram. 0 Response to "Osinbajo hosted by Prime Minister of France as They Agree to Deepen Ties"